Bantry (Irish: Beanntraí) is a town on the coast of County Cork, Ireland, located on the N71 route at the head of Bantry Bay. The Beara peninsula is to the northwest, with Sheep's Head also nearby, on the peninsula south of Bantry Bay. The present population of the town in approximately 3,000 people with an additional 12,500 living within 10 miles. 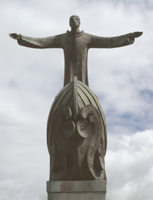 As with many areas on Ireland's south-west coast, Bantry claims an ancient connection to the sixth century saint, Breandán (Naomh Bréanainn) the Navigator. In Irish lore Saint Breandán was the first person to discover America. Wolfe Tone Square in the town commemorates Theobald Wolfe Tone. Tone, a Dublin-born Irishman, led the United Irishmen in what he had hoped to be a re-run of the French Revolution ten years earlier, this was to be done with the help of French Republicans to overthrow British rule (see 1798 rebellion). The ill-fated French invasion force arrived in Bantry in 1796. The town is an important economic centre to the region. Apart from tourism, Bantry has many excellent beaches for surfing due to being located at the West of Europe. Fishing is one of the main industries. Species such as herring, hake, whitefish are important, as well as lobster, crab and salmon. The majority of vessels operate both inside and outside inshore waters. Mussels in particular are harvested in the area. Bantry Bay hosts Ireland’s greatest concentration of the rope-mussel culture (Marine Institute, 1999), several caged salmon farms, and other aquaculture operations.